Who Called the Shots in Hanoi? As any account of combat in the Vietnam War will tell you, America fought an “elusive enemy”: guerrillas who would strike and then disappear; battalion commanders who refused to engage in open battles. But there’s more to the cliché than most people realize. Even by 1967, America’s military, intelligence and civilian leaders had no real idea who was actually calling the shots in Hanoi. To some extent, this is what the North wanted — the impression that decisions were made collectively, albeit under the gentle guiding hand of President Ho Chi Minh. But the American confusion also, inadvertently, reflected the messy, factionalized reality of North Vietnamese politics, one that historians are only now coming to grasp. Thanks to the slow if capricious process of historical declassification, the publications of renegade memoirs and histories, the dissemination of “open letters” by disgruntled former leaders, and the careful and painstaking research and analysis by Vietnam specialists, we now have a better understanding of who was on top in Hanoi and what battles he waged to get there. During the war, American intelligence experts cycled through a long list of suspects. At one point or another, intelligence reports and analyses at the time named all 11 members of the top Communist leadership, the Political Bureau or Politburo (Bo Chinh Tri), as the true leader of the Vietnamese Workers’ Party. The obvious choice, and the one portrayed as the North’s leader in the press, was Ho Chi Minh, a grandfatherly figure whose global travels and illustrious anticolonial career made him a world-renowned figure. Another popular candidate was Vo Nguyen Giap, the general credited with foiling superior French forces in spectacular fashion at Dien Bien Phu. Even Prime Minister Pham Van Dong, who represented the Democratic Republic of Vietnam at the Geneva talks in 1954, was put forward as the real mastermind behind Hanoi’s war. In fact, it was none of these. The real leader was Le Van Nhuan, who later took the name Le Duan, a nondescript party official from humble origins in central Vietnam. Largely out of sight from American intelligence, Le Duan ruled the party with an iron fist from the late 1950s until his death in 1986. No general secretary before or after him was able to hold onto the reins of power for that long. Yet outside of Vietnam, little is known about Le Duan and how he defeated the most powerful nation in the world. Born in 1907, Le Duan was one of five children in a poor family living in a village called Bich La in Quang Tri Province. Le Duan witnessed the transformation of his country under repressive and exploitative French colonial rule. He initially followed in his father’s footsteps by becoming a railway clerk. But then, caught up in the anticolonial fervor that had gripped many young men of his generation, a 21-year-old Le Duan moved north to Hanoi with his new bride, Le Thi Suong. There, in the seat of French power, Le Duan joined the Indochinese Communist Party, earning a seat on the Committee for Education and Training thanks to his railway organizing. But it was in the prisons of colonial Indochina where Le Duan accrued his real revolutionary credentials. Prisoners beaten by their French jailers became further radicalized as they strengthened their ideological convictions and re-erected party structures while locked together in cramped cells. Le Duan served not one but two torturous stints in these colonial prisons. When he was sprung free from his second term in 1945, Vietnam had changed greatly. World War II was all but over, and the French colonizers and their Japanese backers ostensibly vanquished. Most important, a charismatic leader named Ho Chi Minh declared Vietnam’s independence at Ba Dinh Square in Hanoi on Sept. 2. Nonetheless, the post-independence days for Le Duan and for Vietnam were trying times. The French had no intention of letting their empire dissolve without a fight, and Le Duan found that asserting himself in the new government was a challenge. Hoping to be named the minister of defense, he lost out to General Giap, who had a closer relationship with Ho Chi Minh. This slight in 1945 might be one source of Le Duan’s lifelong disdain for Giap and Ho Chi Minh. Instead of staying in Hanoi as a Politburo member with a comfortable ministerial post, Le Duan headed party operations in what can only be called the “Wild South.” He headed to the Mekong Delta, where the party’s grasp on power was much weaker than in the North. Not only were the French poised to retake the southern part of their former colony, but Buddhist sects with their paramilitary forces and Chinese syndicate rogues based in Cho Lon all controlled important parts of the region. Le Duan would not be alone in his task to bring the region under party control. In 1948, Le Duc Tho arrived on the scene to serve as his deputy. 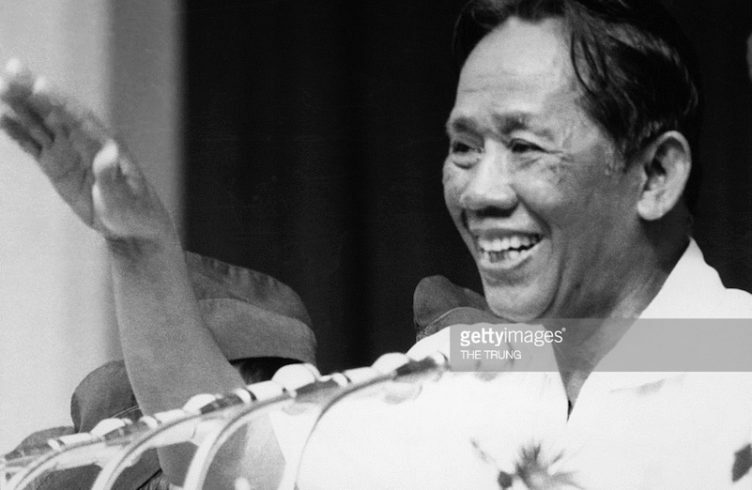 A formidable revolutionary from northern Vietnam who had also climbed the party ranks through his arduous years in colonial prisons, Le Duc Tho forged a powerful partnership with Le Duan, taking down political rivals and sworn enemies. Le Duan’s operations in the South and his partnership with Le Duc Tho proved critical in his rise to the top and influenced his policies once there. With the division of the country at the 17th parallel in 1954, Le Duan and Le Duc Tho parted ways. Tho regrouped to North Vietnam; Le Duan sneaked back to the Mekong Delta, where he witnessed the near decimation of the southern resistance by the South’s president, Ngo Dinh Diem, and the promise of reunification grow more distant. When Le Duan returned to Hanoi, he found the party besieged by difficulties in building socialism in North Vietnam. When a major shake-up in the Communist leadership took place, Le Duan’s time in the South paid off: He was the only Politburo member untainted by the party’s failed policies in the North. 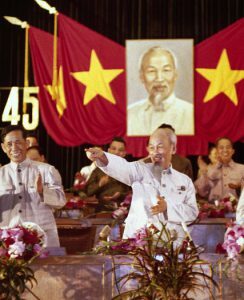 After the demotion of the general secretary, he took over the position, and the Vietnamese Workers’ Party. With Le Duc Tho at his side, Le Duan erected a powerful police state in North Vietnam bent on launching a full-scale war in South Vietnam. Other putative leaders, like Ho Chi Minh and Vo Nguyen Giap, wanted a combination of political and military efforts, but Le Duan and Le Duc Tho believed that reunification under party auspices would happen only with a huge military escalation of the southern insurgency. Their opening came in late 1963, after Presidents Ngo Dinh Diem and John F. Kennedy were assassinated. Sensing an opportunity for a rapid victory against a leaderless south, Le Duan was able to corral the party leadership to go all out and win the war with a daring plan he called the General Offensive and the General Uprising (known in Vietnamese as “Tong tien cong va noi day”). It was a gamble. In 1964, when Le Duan began developing his plans, Communist forces were not strong enough to destroy the government army and thus incite the people to rise up — the “offensive” and the “uprising” — no matter how weak the South’s civilian-military leadership. But he had patience. Sending northern troops and war matériel over maritime and overland infiltration routes took time, but Le Duan eventually transformed the fighting below the 17th parallel from a guerrilla struggle waged by southern forces to a full-scale civil war involving northern battalions. By the fall of 1964, the general secretary drew up Plan X, the final phase of his bid for victory that included an ambitious offensive aimed at Saigon. Sending in heavily armed commando units to hold down key targets, revolutionary troops stationed throughout the capital would incite the people to rise up and seize power from the fallen “puppet regime.” Leaving nothing up to chance, five battalions placed in five directions on the outskirts of the city would seal off the city center from any remaining government soldiers until the main army could arrive. The influx of American combat troops in 1965 put a crimp in Le Duan’s plan for a rapid execution of Plan X, but the general secretary persisted. Convinced that reverting to a defensive guerrilla war would weaken Communist morale, Le Duan ordered his men to maintain the initiative and launch big-unit battles. When this offensive strategy encountered major American sweeping operations in the southern countryside in 1966 and early 1967, Le Duan’s command of the war came under heavy criticism in Hanoi. Le Duan and Le Duc Tho’s control over North Vietnam and the war effort was suddenly at risk. Before they could implement an updated version of Plan X — one that would strike not only at Saigon but also all of the cities and towns across South Vietnam — they had to silence the criticism and regain their hold in Hanoi. While American bombs fell, Le Duan and Le Duc Tho set off a fierce political battle for Hanoi in 1967 that would result in the largest purge in the history of the Vietnamese Communist Party — and set up what they intended to be the climactic campaign of the Vietnam War.